Designs are embroidered in each corner and in center. Jesus is monogrammed inside center design. All Are Custom Handmade By Order! Embroiderd w/gold metallic thread, and trimmed w/white & gold lace. Jesus is monogramed inside center design. Custom handmade by order Women's Purple Satin Church Lap Cloth w/metallic gold embroidery thread and trimmed w/white lace. Bible Frame embroidered in center of cloth. Custom handmade by order Women's Delta White Satin Church Lap Cloth w/red embroidery thread and trimmed w/red lace. Custom handmade by order Women's AKA Pink Satin Church Lap Cloth w/green embroidery thread and trimmed w/green lace. Custom handmade by order Women's Satin Gold Church Lap Cloth w/gold embroidery thread and trimmed w/white and metallic gold lace. Custom handmade by order Women's Satin Royal Blue Church Lap Cloth Handkerchief w/variegated embroidery thread and trimmed w/matching lace. Cross/Flower embroidery designs in each corner. Bible Frame embroidery design in center of cloth. Pink satin Church lap cloth with brown embroidery/monogram. Cloth is trimmed with brown lace with pink ribbon beading. Custom handmade by order Women's Satin White Church Lap Cloth w/variegated black and white embroidery thread and trimmed w/black lace. 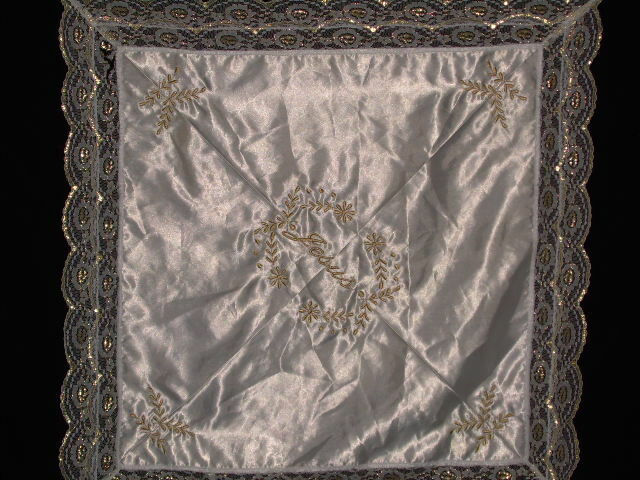 Custom handmade by order Women's Satin Taupe Lap Cloth Handkerchief trimmed w/ivory lace. Custom handmade by order Women's Satin Antique Gold Church Lap Cloth Handkerchief w/variegated embroidery thread and trimmed w/matching lace. Custom handmade by order Women's All white Satin Church lap cloth handkerchief. Custom handmade by order Women's Satin Purple Lap Cloth w/variegated purple embroidery thread and trimmed w/purple lace. Custom handmade by order Women's Satin Red Church Lap Cloth Handkerchief w/variegated red embroidery thread and trimmed w/red lace. 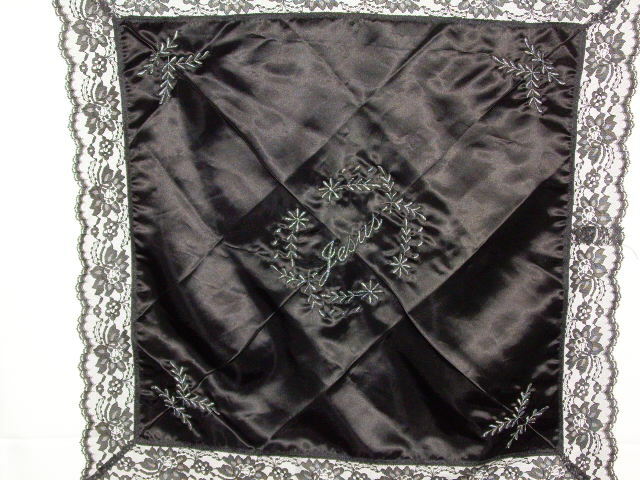 Custom handmade by order Women's Black lap cloth handkerchief w/black & silver metallic thread, and trimmed w/black lace. Custom handmade by order Women's Lavender lap cloth handkerchief w/orchid & lavender twist embroidery thread, trimmed w/lavender lace. Custom handmade by order Women's White satin lap cloth handkerchief w/silver metallic thread, trimmed w/white & silver lace. Custom handmade by order Women's Taupe satin lap cloth handkerchief w/brown variegated embroidery thread, trimmed w/brown lace. Pink lap cloth embroidered w/varigated pink embroidery thread and trimmed w/pink lace. Royal blue lap cloth embroidered w/varigated blue embroidery thread and trimmed w/royal blue lace. Custom handmade by order Women's Creme/Ivory lap cloth handkerchief w/variegated taupe embroidery thread, trimmed w/creme/ivory lace. 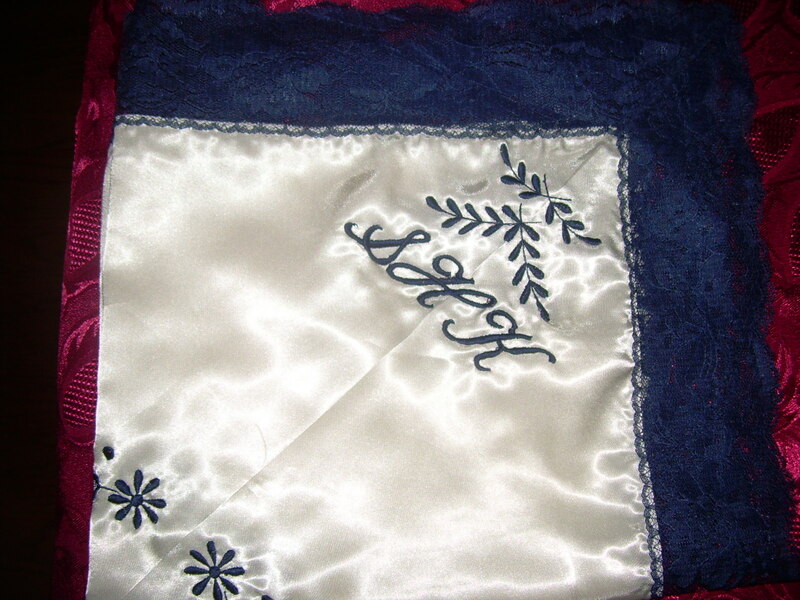 Custom handmade by order creme/ivory satin church lap cloth trimmed w/navy blue lace and navy blue embroidery. Custom handmade by order black satin Church lap cloth trimmed w/lavender lace and lavender embroidery. Custom handmade by order Women's Silver Satin lap cloth handkerchief w/black & gray twist embroidery thread, trimmed w/black lace. Custom handmade by order Women's Satin Yellow Gold Lap Cloth Handkercief w/burgandy embroidery thread, trimmed w/burgandy lace.